May is just around the corner and that means an abundance of Bank Holidays and a half term to boot. We have lots of great ideas and inspiration for family days out and things to do with the kids plus plenty of savings too. Family days out can often mean car journeys and Bank Holidays can often mean traffic jams so we’ve asked our friends at What’s On 4 to give us their top tips for fun and games on the move. At What’s On 4 we are always being asked for our recommendations for fabulous places to go with children – like our fantastic awards venue for 2015 – Drayton Manor Hotel and Theme Park – but there’s no point planning a fantastic family outing or trip if you all arrive frazzled and fractious! Plan ahead, be prepared and involve the children from the start – look at the route you will be taking on the map, discuss landmarks, timings and allow children to pack a bag of their favourite things – toys, books, snugly blanket etc. Consider your travel time – leaving very early in the morning or later in the evening can mean a much more bearable trip. Children are less likely to be irritable, the roads calmer and little ones more likely to sleep. We have found that changing direct from swimmers to PJS and heading home straight from the beach early evening can be a great way to make the most of the last day of the holiday. Parents increasingly rely on tech for long (and even short journeys) – IPads, mobiles, DSs, DVD players etc and these can work well for a while but can also inevitably can lead to frustration and tension – children squabbling over devices, dvds jumping, screens sliding around with the car motion, flat batteries/low charge and head phones that stop working or won’t stay in little ears. For the driver the cacophony of noise from different games in the back seat can be very distracting, as can the passenger parent, straining between the seats to try and fix some random IT crisis on the move and don’t forget car sickness can also be caused by endless concentration on a small screen. Sickness and tech are often an unfortunate and costly combination! And we are often warned of the dangers of excessive screen time so what other options are there? Car journeys are a great opportunity to really catch up with children. It can be rare to have the whole family in one place for a considerable time so value it, talk to your children, raise different topics and listen to them express themselves and their opinions. There’s a fabulous range out there and choosing a book or an author/character everyone is familiar with works well. There are so many books that appeal to both children and adults on different levels and both genders – you can’t go too wrong with Roald Dahl, David Walliams and JK Rowling. Certainly all our sanities were saved on a very tedious journey to Devon on a hot, bank holiday weekend by ‘The Prisoner of Azkaban’. Don’t just keep to the motorways – that’s boring for everyone and look out for those landmarks that show your progress. Take regular breaks and try to include some physical activity – a park, playground, beach or an attraction that requires some walking will give everyone a chance to release pent-up energy. Singing, music and stories – at the risk of losing your sanity, stick to familiar songs and rhymes (Heads, Shoulders, Knees and Toes; the Wheels on the Bus) or if you have a broader age range/older kids have a variety of familiar music to hand. Get children to take it in turns to choose their favourite song to sing or hear. Old classics like Beatles Yellow Submarine can really fun to learn and less grating than hickory-dickory-dock on repeat! Essential to help while away time, prevent low blood sugar, reduce frequent stops and to keep little ones amused. Sweets are of course a reliable distraction but too much sugar can lead to over-excited and irritability. Instead try and pack a series of snacks, bread-sticks, satsumas to peel, big apples to nibble on, things to dip, pots of dried fruit and nuts, crisps and water – inevitably there’s going to be mess but carefully selected food can be a heaven-sent distraction. Keep the wipes at hand and the sweets in reserve for emergencies – the inevitable traffic jam, when the sat nav gets it wrong again etc. If children aren’t comfortable, they won’t be happy. Avoid arguments and discomfort by keeping the back seats luggage-free (not always easy!) and making sure there is enough room for the kids to spread out with pillows/cushions and blankets to encourage sleep. Finally, try to make the journey the first part of the holiday, rather than just a way to get from ‘A to B’. Keep your own stress levels in check by being prepared – it’s your break too remember (!) and if you are determined to enjoy, rather than endure the trip, the rest of the family will doubtless want to be in on the action. Just make sure you’ve packed the corkscrew at the top for when you arrive! If that isn’t inspirational enough for you, we have five fantastic sets of Scentos Stationary Sets to give away, courtesy of What’s On 4! Click here to enter. Bumper box of Tobar’s Scentos stationery including marker pens, pencils, paints and more. 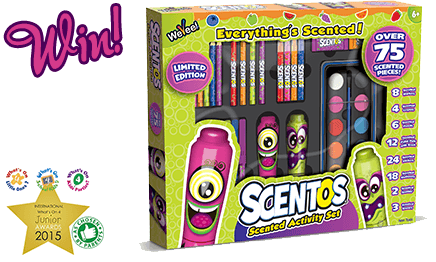 This large Scentos kit contains a diverse mix of stationery that gives off a sweet, fruity scent when used. Flavours in the set include blueberry, watermelon, grape, strawberry, orange and green apple. The box contains more than 75 pieces of scented stationery.